Your MasterCard Debit Card is also your ATM card, giving you 24/7 ATM access to your accounts. As a member of Community Financial, you have access to two ATM Networks with thousands of participating surcharge-free ATMs. 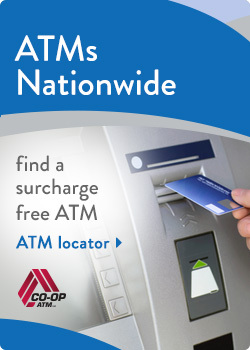 Alliance One and CO-OP Network ATMs can be found at credit unions and convenience stores across the country. You can make deposits, withdrawals and balance inquiries with your ATM card at thousands of NYCE ATMs across Michigan, you can also obtain cash at CIRRUS ATMs worldwide. Your credit union does not charge a fee for these foreign ATMs but the owner of the machine may impose a surcharge fee. These fees are posted on the ATM.